Germaine and I are not just husband and wife, we are best friends. We do a lot together. In a 24 hour days, most of our time is spent either together or talking on the phone and texting. One thing we enjoy doing as a couple is working out. In between parenting, work, and running errands we exercise. Germaine shy’s away from being on the blog, but I asked him to help me with today’s post. I even bought him some new workout apparel to increase my chance of getting a yes. I bought him a pair of Mako shorts and the General short sleeve top from RhoneApparel.com. This was our first time ordering from Rhone Apparel and we really like the quality, feel and look of their clothing. One of the most important things I learned from my husband when it comes to exercise is warming up. I used to skip this step and have injured myself twice as a result. To warm up you can stretch or lift some really light weights. Now, when working out as a couple you can really do any exercises you like. Our favorite exercises involve weights, but we often do body weight exercises like planks. When working out with weights we keep it pretty serious. To much playing around can be dangerous so keep that in mind when working out with your boo. We we do body weight exercises like squats, lunges and planks we use this time to laugh and have fun together. Execising is a natural stress reliever so save the heavy talk for another time. Use this time to relax and enjoy one another. Get to know each others work out style. Working out as a couple has strengthened our relationship, improved or communication and our bond. For us, the more time we spend together, the more we learn about one another and the more closer we are. When attempting to start a new hobby with your spouse, be patient with one another. Germaine and I didn’t start out as besties, it’s a bond we’ve built with time. Invest in learning more about getting fit as a couple and use that common thread to grow closer together. @RhoneApparel #RhoneFever #ad I have 3 years until my 40th birthday, I’m a mom of 4 and a grandma. My husband is over 40 and we are in some of the best shape we’ve been in since our early 20’s. I attribute it all to a God focused lifestyle, strong marriage and healthy lifestyle. After giving birth to four kids I was tired all the time, feeling grumpy and suffering from migraine headaches. 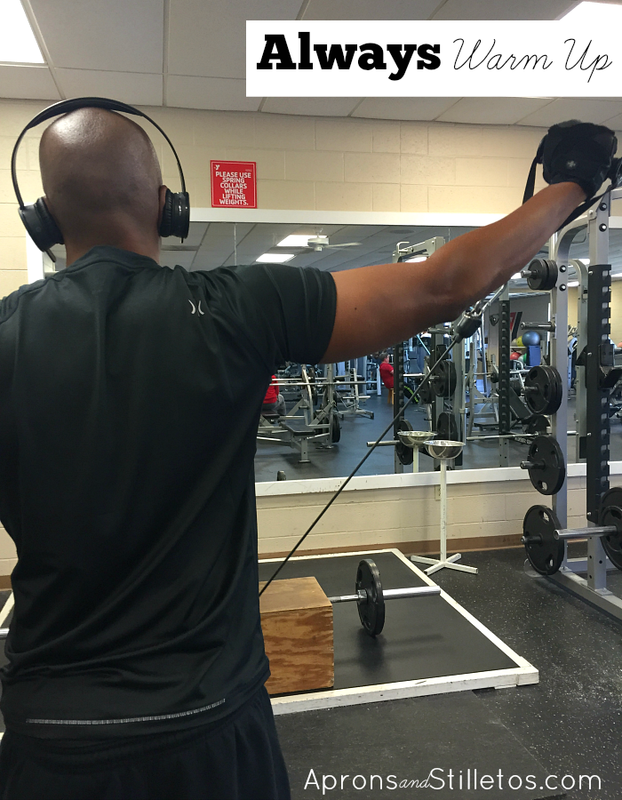 My husband got back in the gym first and then he began encouraging me to do the same. It only took 5 years for me to finally give in. I had so many excuses. I was tired. I was busy. I didn’t feel like bringing the kids. I looked fine. All of the reasons were valid, but he was so concerned about my long term health and quality of life as we aged that he wouldn’t give up. I’m so glad he didn’t stop encouraging me. 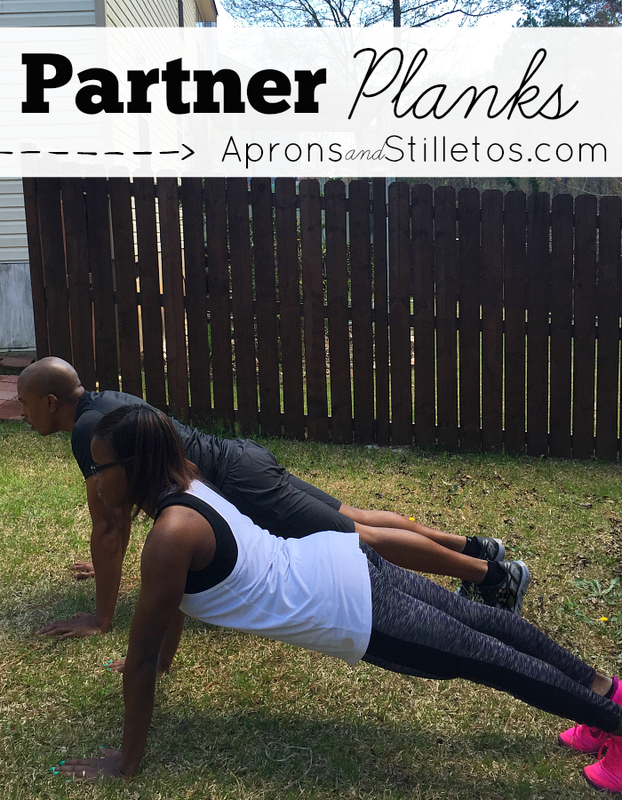 Today we are sharing some easy exercises for couples and some benefits of doing more together as a couple. I encourage you to stop by the blog and check out the post. http://www.apronsandstilletos.com/2015/03/easy-exercise-routine-for-couples.html What’s holding you back from exercising like you should? This is a great suggestion. I trying to lose weight after having a baby and my fiance gained sympathy weight. I've noticed more he's struggling more with getting back into healthy eating and exercise routines more than I am so maybe this can help motivate him. We used to work out at the gym together before having the LO but working out in the backyard is a great idea. my husband and I need to start working out together. I might motivate me! I can't wait to start doing these with my new boyfriend! I'm currently out of running due to an ankle injury but these are perfect exercises that don't strain it too much! I love it!! I love spending time together hiking with my husband–he probably wouldn't be into the squats and lunges, but great to spend time together exercising. Those exercises do not look easy at least for my husband and I! Whoosh that is dedication. I am just trying to get my husband to walk with me.